Warning: There is a photo towards the end of this post that may be difficult to see or hard to look at if you are squeamish. What a crazy last few days it has been! I’m not even sure where to begin but here goes! Last Friday, I took Cannon in for his surgery. 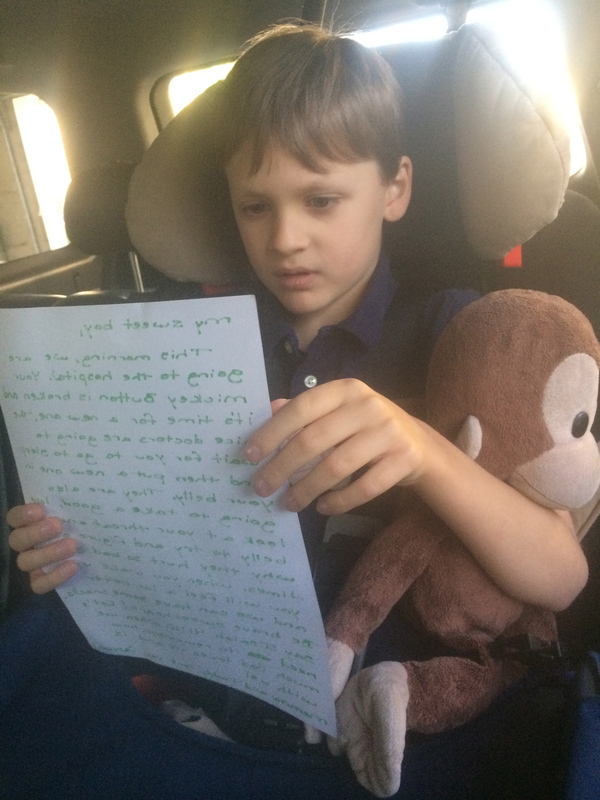 Our ride to the hospital always includes a social story. These are stories that gently explains to him exactly what is going to happen to him. To aide in coping. We do it every time he has a surgery or procedure and it helps tremendously as he seems to understand the written word better than the spoken. I was running late but managed to scribble this down as I ran out the door…….. The first part of the surgery was to be the endoscopy. Cannon’s G.I. doctor would do an Upper and a Lower scope to see if he could find any issues or sources of his abdominal pain. There would also be biopsies taken from all over, as well as blood drawn for various tests. He has had bouts of extreme lethargy, paleness, etc. and we were so ready to get to the bottom of things. After some time, the doctor came out shaking his head. He asked me when and what Cannon had eaten last. I grabbed my notebook. For as long as Cannon has struggled with G.I. issues….I have been keeping these notebooks. Notebooks that eventually get filed into large binders and stored. I record everything that goes in (food wise), everything that comes out (you get the picture), as well as behavior notes….doctor’s appointments, etc. I have to. I can’t remember anything anymore. So tired! Anyhow, my notebook told me exactly what he had eaten for dinner the night before and what time. He confirmed with me that he had had nothing after midnight. Nothing….yes. A sip of water to take meds and that is it. He shook his head some more and said he found the problem. Cannon’s stomach was completely full 14 hours after he had last eaten. So full he couldn’t even get in there. He said he was in shock. Had taken pictures. He just couldn’t believe how full it was. He had had to pump his stomach. He called this disorder Delayed Gastric Emptying or Gastroparesis. Partial paralysis of the stomach. This, he believed, was the source of all the pain he has been having. I really thought it was going to be scar tissue buildup on his button but no…..this was much worse news. This is a life long, chronic, and painful problem. And it is the cause of the severe bacterial overgrowth that we found in Cannon back in November. A problem so bad….it had taken 4 months (when it should have only taken 2 weeks) of high powered, twice a day antibiotics to get under control. And he still requires a maintenance dose every other day to keep the issue at bay. Stomach contents hanging out for that long and basically stewing….causes the bacteria to build. We could not figure out why it was doing this as we flush his colon daily….but now we know. My poor buddy! The worst part to me is that with Cannon’s limited language…..he has been suffering for so long with this. God only knows how long! And he didn’t have the capability to tell us about it. So….long story short…..his stomach fills up….it isn’t strong enough to break down the food….so it just sits there. Until it is so full and more comes food comes along….pushing it on its way. The bacteria has formed in the meantime. Now it heads into a colon that also doesn’t function. It sits and waits for our daily flush to move it on out. Heartbreaking! Disgusting! My poor buddy! The only good news on the G.I. front is that all the biopsies and labs came back normal. Thank goodness! No more surprises. The doctor is telling us that right now our only course of treatment is to put him on another antibiotic long term to try to get his stomach to respond and move. The chance of it working is poor. And the concept of him being on yet another antibiotic indefinitely is not so great. But as the nurse pointed out…..the risks are outweighed by his need for the medicine. So, therefore, the doctor feels that this is where we begin. I am going to fill the prescription for now but I am not sold on this idea. Especially as a long term solution. I am going to look into other methods and courses of treatment. This isn’t a super common problem and there are few specialists who are experts on it (more good news) so we will see how far I get. So, that was part 1 of surgery day. Phew! And I thought that was enough. Part 2 was to be the exchanging of his Chait Button. The button placed in his abdomen that essentially does the job his weak colon cannot. This is the part that always makes me super nervous. As mentioned in previous posts, it can be difficult to remove without issue as well as to re-insert a new device due to the spiral nature of the tube below the skin. That morning, the Interventional Radiologist reassured me that all would be fine and promised to look for scar tissue buildup even though he was convinced…..it wasn’t there. I waited some more after signing away my consent and was surprised how quickly the doc returned to tell me the procedure was over. Like really surprised. He seemed quite proud to tell that the re-insertion phase only took 30 seconds. Which actually concerned me far more than impressed me. Call it my “mom gut” or whatever…..but it just did. I was then taken to the PACU (Pediatric Acute Care Unit) to wait for my sweetheart to wake up. While doing so, I always work with the Anesthesiologist and nurse to ensure the best wake up possible. The Anesthesiologist gives him a little something to ease his transition from asleep to alert. And stays close by incase we have a problem. We have had some horrific wakes in the past. I also try to have a movie he likes ready to watch, his beloved Curious George monkey ready to snuggle, iPad charged up and ready to go, as well as other distractions at arms reach. I have also been known to bribe him with the possibility of snacks or milk if he is calm. I also ask the nurse to remove any un-necessary medical tubes, monitors,etc…..because he is so sensitive and can get super upset about those being on his body. We usually remove the sticky heart monitor pads from his chest, IV, and pulse ox monitors if possible. I also wanted to remove the abdominal binder or band that he wears to re-dress the site of his button before he woke. We have a particular way of doing this. We cut a slit in a gauze pad and slide it around the button. This catches any ooze. Place another sterile dressing pad with adhesive tabs over the top of that. And add a layer of medical netting over the top. This keeps the velcro on his band from scratching his back. Finally, he wears the band we had invented by a local prosthetics/orthotics company as a final layer of protection. Here is what that looks like….. 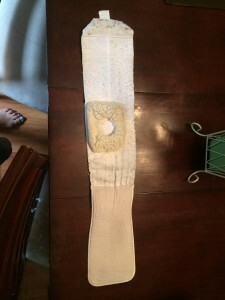 So, I pulled his band off to re-dress and to my complete and total surprise…..as soon as I took the compression off…..the underlying tube began to move out of his body! I jumped back and told the nurse this was NOT normal. The button should be flush with the skin! He took his finger and pushed it back in and told me it was fine. I protested a bit but eventually re-dressed the area and put his band back on. He was beginning to wake up. This was a VERY good wake-up compared to some in the past. They used a different type of Anesthesia than has been used on Cannon before and this proved to be a good choice. Although it was slightly disturbing as his body made some rather strange contortions and such. The nurse was pleased and allowed him to have some milk fairly soon after wake-up. Followed shortly thereafter by a snack. When we dressed him to go home…..he delayed discharge a bit by throwing up everywhere. I mean everywhere. Yes, even in my hair. But he laid back and rested for a while and soon enough……we were on our way home. To heal and wait to hear back about the biopsies and labs. At home, he laid on the couch, watched a movie, read books, and just rested. He looked pretty darn good considering and I was encouraged. Until I took the band off that night. THE SAME THING HAPPENED THAT HAD IN RECOVERY! The tube began pushing its way out. I actually got a ruler and measured. It was 3/4 inch out! Cannon was quite freaked out by this. He cried and kept yelling at me to push it back in. The next morning, when I went to flush his button, it came out 1 inch! And it did the same when I changed the dressing that night. I called and talked to the G.I. doctor on call Sunday morning because I was obviously very concerned. He said the Interventional Radiologist had to deal with it since they had been the one to put it in. And, of course, they aren’t in on the weekends. So, Monday morning, with the tube more than 1 1/4 inches now out of his body…..I finally got someone on the phone. They said to keep him from eating and drinking and bring him to the hospital. When we got there and through the check in process…..someone from I.R. came out and told us that they would definitely get to us but it would be about 4 hours. Well, that would have been nice to know before I left home. Sigh. So, I had to keep starving him, distracting him with books and electronics, and carrying him around the hospital (as he had no energy to walk) to try and keep his mind off things. Finally, they brought us back and the resident began discussing things with me. And he was talking about some completely different tube! Obviously he hadn’t read Cannon’s chart. He didn’t even know what the Chait Button was or did. I asked for the Attending. When she came out, I removed the dressing and she saw the problem. She began talking about getting an I.V. in him and starting conscious sedation. I quickly reminded them that this doesn’t settle Cannon enough and he has always required anesthesia. They look dumbfounded and left the room. I wanted to say…..Please someone look at his chart….it’s all there! When they returned they informed me that not only did they not have the size button needed to fix Cannon’s problem…..they also didn’t have an Anesthesiologist available to help with the procedure. It was at this time, they admitted that the tube that had been put in on Friday was 4 cm too long. He needed the same size he had had in in the first place. Which means they did not have both sizes available at the time of his surgery. I questioned this but as this was not the same Interventional Radiologist….she just shrugged. I wasn’t happy. I expressed concern as it seemed to be coming out more and more each day. They said the coils of the tube should hold it from here on out. What about infection….I wondered? It’s going in and out whenever the compression is off. They said not to worry. Now, we had to leave. He’s been waiting all day, un-necessarily, to eat. And no resolution. 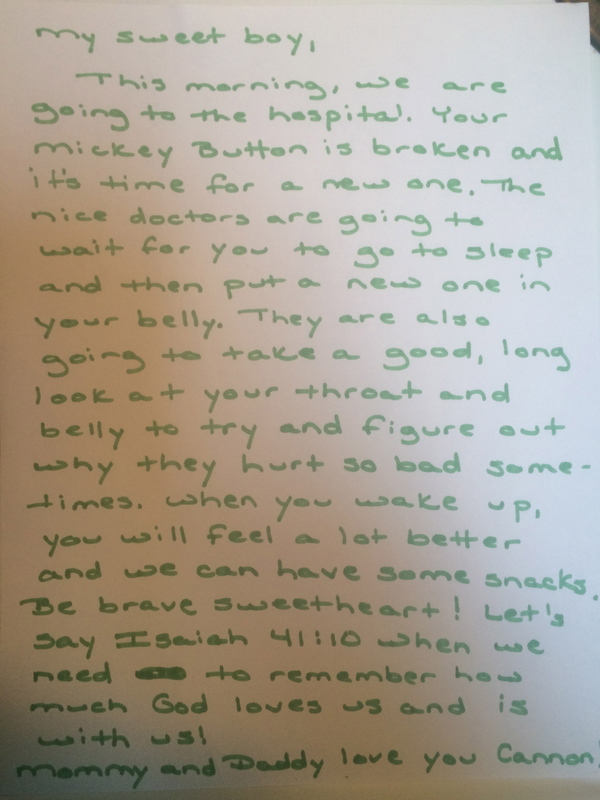 We were told the new button would have to be over-nighted in and Anesthesia would be requested for Wednesday morning. So, we went home….again. Wednesday morning, we were scheduled for a 9 a.m. procedure but got bumped back to noon. Another long period of fasting for my buddy. But all went smoothly this go round. The right size tube was inserted (the same size he had had prior to the surgery) and there were no problems. He woke even better than before and we headed home with no nausea issues. I admit it. I struggled with being quite angry at the doctor. Had he been in too big a hurry to notice that the button didn’t fit? Or did he notice, cram it back in there, and put compression on it. Can you imagine how that felt to my Cannon……keeping in mind that his sensory issues heighten all of his bodily sensations. I had to spend a lot of time praying for this man. For his work ethic, empathy level, future patients, etc. I am not perfect. And I don’t know if I would say I am over this……but I am on that road. It’s over. Cannon’s ok now. And THAT is what matters. (But you can bet I sent the previous pic to our G.I. doc’s email address…..as he is the President of the hospital as well.) We do love our hospital. This was an unfortunate incident. Back to the Gastroparesis….the new diagnosis. I am so insanely sad and disappointed to learn about this new challenge. To say the least. There have been tears. Quite a few if I am being honest. I hate it! I hate it so much! But I have to leave it at that and focus on trusting God in this process. I cannot give Satan a foothold…..a way into my thoughts and my relationship with my God. A dear friend shared Psalm 143 with me. Here are a few select verses that I am clinging to. You may have noticed that the blog has a new song playing when you come visit. I think it is perfect to share with you know. Our prayer is that each day…….we will remember and focus on these words and the concept that God is sovereign (the greatest in status or authority or power). And He is sovereign over us. He has got this. It’s no surprise to him. I have to just hang in there and keep doing my best to never stop looking for more treatment options and focusing on doing everything I can to help Cannon avoid pain. God bless you all! We will check in again soon!